Kara-Keche, a sprawling deposit containing about 430 million tons of coal in mountainous Naryn Province, is a key asset for Kyrgyzstan’s struggling economy. It’s not just the government and an array of local companies plying the open pit mines that are interested in the dirty black stuff. Last November, a shootout at Kara-Keche among gangsters highlighted an unsavory side of the business. According to the government’s development strategy, Kyrgyzstan could be sitting on over 3.3 billion tons of coal—enough, by some measures, to provide the country with energy for centuries. But with coal production split across a network of inefficient producers, prices are high, meaning that Kyrgyzstan now sources much of its coal abroad. The strategy says the industry is in “a condition of crisis.” Foreign investors – seen by authorities as a potential balm – are curious, but cautious given the lack of transportation infrastructure, corruption and violence—conditions similar to that which have hampered the development of the country’s gold sector. Today, annual production is a quarter of what it was during its Soviet-subsidized peak in the late 1970s, according to Almaz Alimbekov, head of the Mining Policy Department at Kyrgyzstan’s Ministry of Economy. Bishkek’s central heating plant, the country’s largest coal-powered operation, relies on imports from neighboring Kazakhstan for 70 percent of its coal consumption; those imports cost the impecunious state budget roughly $40 million a year. The remaining 30 percent comes from Kara-Keche and other Kyrgyz deposits, Alimbekov says. Coal is a popular topic of discussion, not least because it is used to heat homes across the country during Kyrgyzstan’s harsh winters. Last winter, according to the 24.kg news agency, prices for heating coal varied from roughly $50 a ton to over $200 a ton, with prices tending to rise as temperatures drop. Communities closest to coal mines often expect to receive coal at discounted rates, though social assistance is not a mandatory aspect of mining licenses. Recently local media reports have fixed attention on the fallout from a November shootout at Kara-Keche, reputedly between members of a Naryn-based criminal group and bandits loyal to Maksat ‘the Diver’ Abakirov, an alleged gangster from Issyk-Kul province seen as instrumental in provoking unrest in the communities surrounding the Canadian-owned Kumtor gold mine in May 2013. While no one was reported killed in that shootout, Aibek Mambetaliev – an individual the Vechernii Bishkek newspaper once described as a Naryn mobster responsible for “deciding whom coal could be sold to” – was found dead at the deposit 10 days later. Then a group identified as Mambetaliev’s relatives reportedly attacked three police officers on trial in connection with his death inside a courtroom on February 20. The relatives set the three on fire with petrol bombs and subsequently kidnapped one; beating him heavily. Another officer escaped the scene and headed towards a local river, where he is presumed to have been drowned by the mob. The state prosecutor has launched criminal cases against the assailants, but their location is unknown. Tumult in the coal sector is not new. Back in 2005, following the overthrow of Kyrgyzstan’s first president, renegade opposition leader Nurlan “The Coal King” Motuyev famously seized the Kara-Keche deposit, expelling the companies working there. He went on to preside over a sharp fall in production. Bringing a sense of order to the sector will require significant foreign investment, says Alimbekov, the Economy Ministry’s mining specialist. Part of the problem, he says, is that some of the country’s best deposits are mined by a bevy of inefficient local companies that “lack capital and are logistically weak,” making them reliant on traders under the influence of racketeers. “They can’t provide enough coal for [Bishkek’s heating plant] because they don’t have the best technology for extraction and they don’t have the transport,” Alimbekov told EurasiaNet.org. Ideally, he said, Kara-Keche, should be mined by a single foreign investor. Western firms are eying the long-stalled China-Kyrgyzstan-Uzbekistan rail link, says Alastair Muir, director of technical operations for Celsius Coal, an Australian mining firm with a license in Kyrgyzstan’s southern Uzgen region. Kyrgyzstan has “massive potential” for supplying coking coal, a variety used in metallurgy, to steelmakers in the Chinese province of Xinjiang, but “transport is a massive factor for us,” Muir said at the Turkey and Central Asia Mining Summit in Istanbul on January 28. The rail has been on hold for years and shows no sign of being built any time soon. 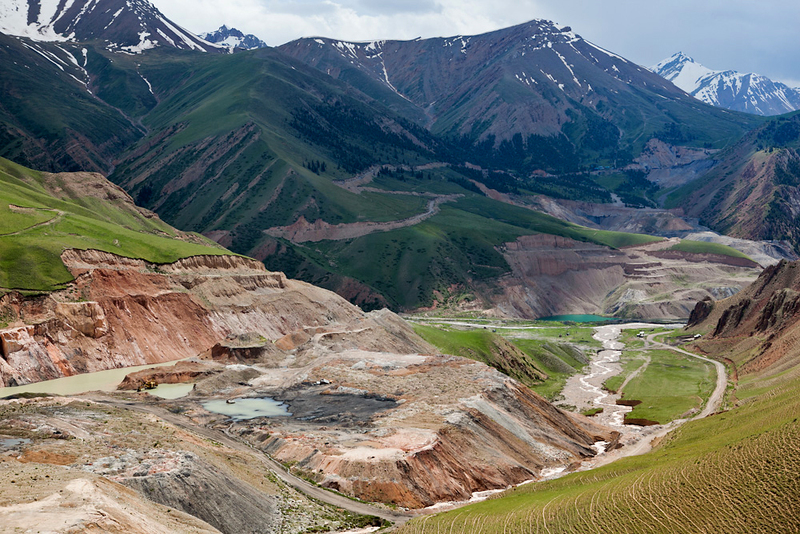 If foreign investors ever take the plunge, they’ll still have to deal with local communities, warns Valentin Bogdetski, head of the Association of Kyrgyz Miners. Communities’ high expectations for social assistance from mining firms “borders on extortion,” he says, and may frighten investors.